I'll just start by saying it. I AM NOT a Guns N’ Roses fan. Now before you start huffing and puffing around in front of whatever media device you're using to read this, just hear me out. Guns N’ Roses as a band was a fantastic collaboration and I will admit that I was charmed initially when I heard the first spacey licks of “Welcome To The Jungle”. But the train took off too fast for me and I fell behind. The songs just didn’t stick for me. 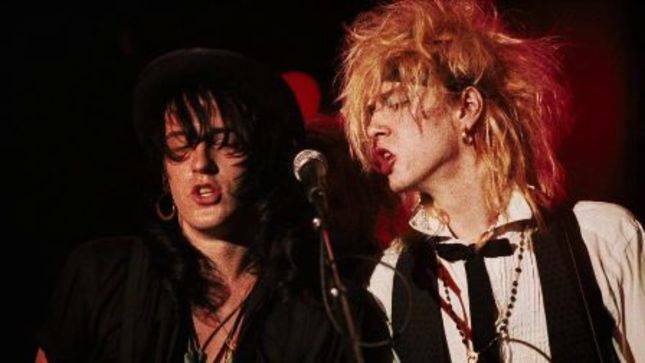 Guns N’ Roses, being Duff McKagan’s most rewarding musical venture is kind of like the co-star of It's So Easy and Other Lies. The real focus is Duff himself and his road to overcome his years of addiction that started even before his connecting with Guns N’ Roses. What we get with It's So Easy and Other Lies is a live performance interluded with Duff reading passages from his book of the same title. We obviously are only getting pieces of the book in the film and I will make it clear that I am only addressing the film here and NOT the book. Duff’s charm and character beam right from the stage as he tells story after story as we see old pictures, never seen until this documentary of his professional and family life. Nothing like seeing a picture the bass player of Guns N’ Roses, the baddest band in the land, at a barbeque with his relatives. It's extremely grounding and really gave It's So Easy and Other Lies a humble feel. Duff pulls no punches on featuring his struggles from his book front and center for the audience between songs. I think that Duff McKagan and director Christopher Duddy really wanted It's So Easy and Other Lies to have a message for the viewer which while I think the message is good, I have always found it funny to hear from aging rock stars about the perils of addiction they faced as a warning to younger people to stay away from it. That has no bearing on my review of It's So Easy and Other Lies, it is just an observation. Dude. I hope that Aqua Net stock finally pays off. 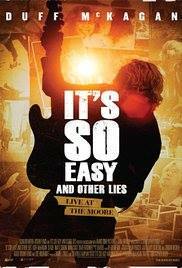 It's So Easy and Other Lies is an enjoyable 84 minutes for even the non-Guns N’ Roses fan and it will give you a greater understanding and respect for a founding member of one of Rock N’ Roll's most notorious bands.